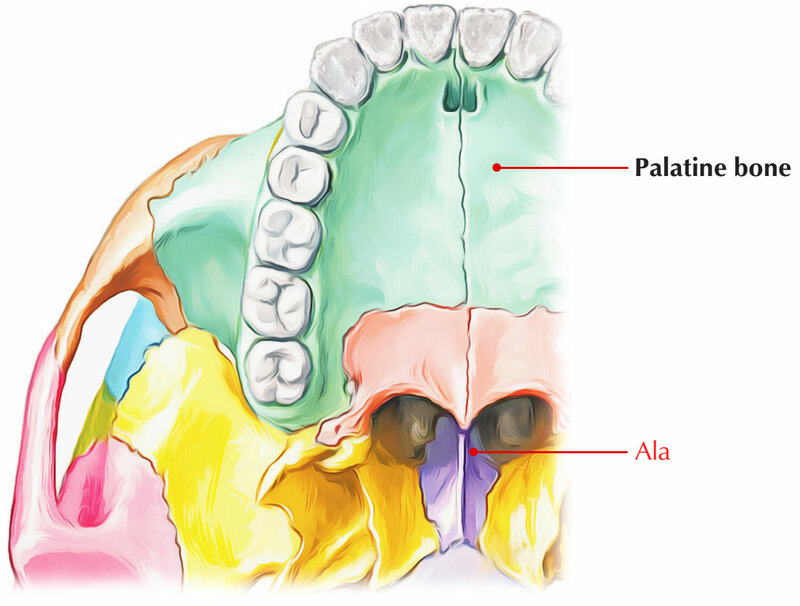 The external nose is attached superiorly to the nasal bones and inferiorly to the anterior nasal spine. Each protruding lateral margin of nose is known individually as a wing of the nose or an ala of nose. Attaching to the vestibule, its internal surface of ala of nose is covered with keratinized stratified squamous epithelium. Many unusually large sebaceous glands and hair follicles with very fine hair describe the skin covering the outer surface of the ala of nose. The keratinized stratified squamous epithelium of the skin spread out through the nares inside the vestibule, where it has few sweat glands, numerous sebaceous glands, and hair follicles with a few stiff, thick hairs protruding into the airway, helping to sift large dust particles from the inspired air. By the tightening of skeletal muscle fibers the size of the ala of nose can be altered. The keratinized epithelium converts into a non-keratinized and non-hairy type in the posterior region of the vestibule, specifying the beginning of the respiratory part of the nasal cavity. Ala of Nose is supplied by alar artery. The nasal branch of the infraorbital nerve supplies skin of the ala of the nose.